A Conservative MP, Bill Wiggin, has introduced a bill in Parliament to ban the consumption of dog meat in the UK. 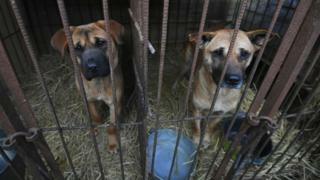 The bill would make it illegal to eat dog meat and to transport, possess or donate it for the purposes of consumption. It is not currently against the law in the UK to eat dog meat. About 30 million dogs are eaten around the world annually – 10 million of those are consumed in China. “In the Republic of Korea, dog meat is the fourth highest consumed meat after pork, beef and chicken,” Mr Wiggin told the Commons, adding that the dog slaughter industry was worth “$220m-$273m” (£210m). “Many consumers believe it has medicinal value and believe it brings good fortune, yet none of these alleged health benefits have any scientific basis,” he said. Mr Wiggin said there was no evidence that dog meat was being consumed in the UK but he “would like our country to join in setting an example to the world”. The USA, Germany, Austria, South Australia, Taiwan and Hong Kong have already banned dog meat consumption. Mr Wiggin condemned the methods by which dogs were slaughtered for market. The conditions in which they were farmed were “deliberately cruel,” he said. “It is believed that inflicting suffering raises the animal’s adrenaline levels, tenderising the meat, and adding medical properties,” Mr Wiggin said. He said the bill was not just about the consumption of dog meat but also the prevention of cruelty against animals. Nearly half of all dogs in the slaughter industry died “unspeakably cruel” deaths before they reached their final destination, Mr Wiggin said. He told the House that routine methods of slaughter included bludgeoning, hanging, boiling, skinning and blowtorching alive. The bill passed to second reading unopposed, but is unlikely to progress any further without government support.